It’s the end of the year! One of the perks for my students at the end of the year is getting to finally pick their own game choice. 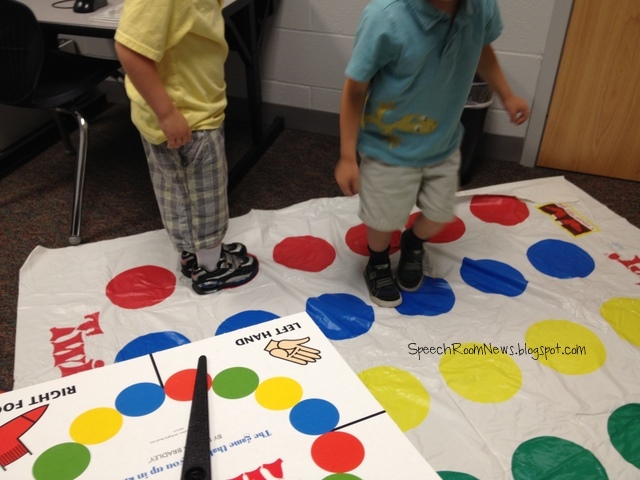 Last week a few little guys chose Twister. After I thought for a second this is what we came up with! 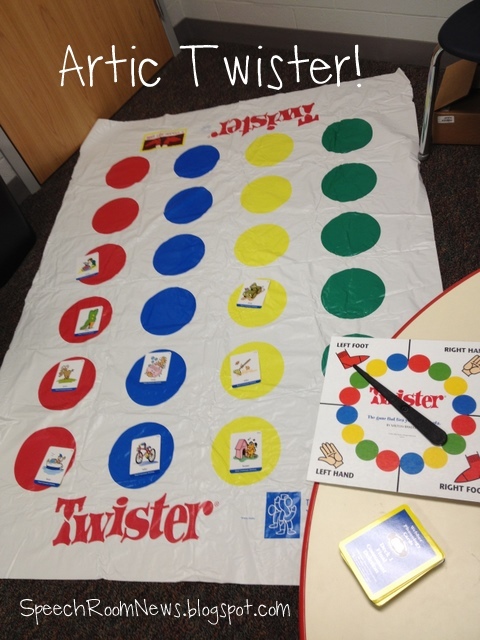 Twister for artic/phonology students! We only used the colors on the spinner board for the first part. Each student chose a color and they needed to cover each of their dots. We spun our spinner board and each said the word multiple trials, before we covered the appropriate dot! It was ‘super fun’ as my little guys said. Our board was big so it gave us a lot of chances to say our good sounds! We needed to work on some following directions in this group too. So we removed our cards and used our ‘jumping feet’ to listen for directions. We spun for colors and listened for extra directions like “Jump to blue and clap.” My friends were getting very excited, making listening for both directions really difficult! 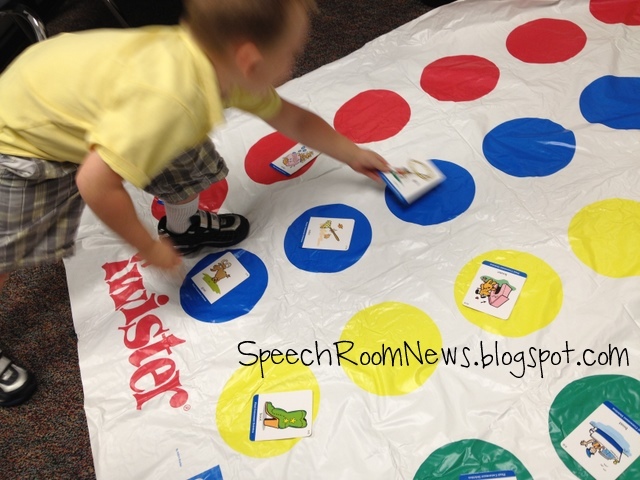 Any ideas on how you can use Twister in your speech rooms? Jenna – great job! and great ideas! Just used Twister this past week with my pre-k kiddos (great minds think alike–lol!) I used it with the Weber cards too. My groups are small (2 in most groups) so I placed their specific sounds randomly on dots (an even 12 cards for each kid) and spun spinner. I helped them locate one of their cards, say the word and then place hand/foot on dot…they love this game…and the chance to get up out of their seats and be active! Can’t believe I didn’t think of this before. GREAT for directions and arctic. Thanks! I love how you used this game!! Totally adaptable to any goal, those are the best kind! I have an idea to adapt the game for feeding therapy, which I don’t think is applicable for the school setting, but I’ll share it anyway in case SLPs in an outpatient clinic or private practice are reading this. Eat a food that matches the color the spinner lands on! (i.e. strawberry for red, blueberries for blue, etc!) A fun and rewarding way to educate about and promote healthy eating 🙂 A quite similar idea to a rainbow chart (www.todayiatearainbow.com) which is very motivating for my kids to eat their fruits and veggies! I too love using twister in my therapy!!! My poor twister has been used so often the poor box is barely still together on one corner. Ha. Anyway, I used it the way you have shown but also as with a few “twists” (no pun intended). 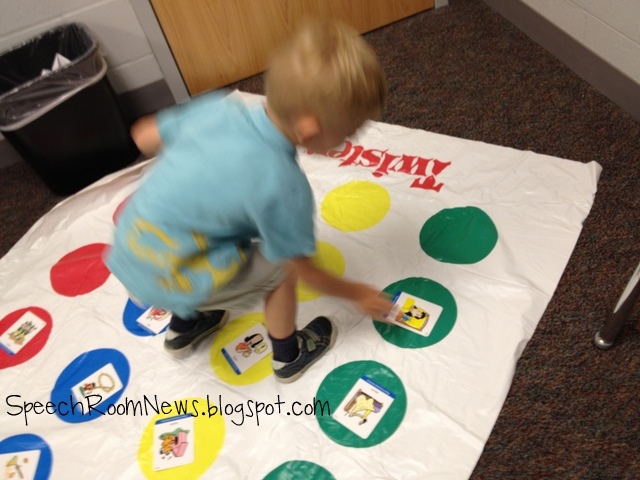 Twister ball bounce: Mat on floor, cards on mat, spin, throw ball on color you spun. IF if lands on color, you get the card (AND possibly a prize…stickers usually, interspersed behind cards) and practice. Twister ball throw: same as above with mat on wall, cards (with poster putty) stuck on dots…or sometimes no card on wall….just practiced them from a pile then, spin, try to hit color you spun. Pin the card on the dot: Mat on wall, practice card, spin, poster putty on card, turn 3xs, blindfold/put your hand over kids eyes (b/c I worked with little ones I always must put my hand over their eyes and walked them to wall…safety issue) and let them try to pin card on correct color. 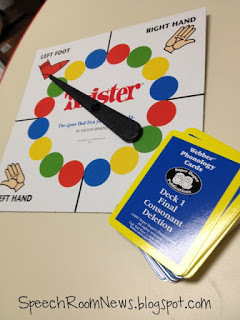 Twister disk thrower: I bought a nerf disk gun (but call it a disk thrower in school) from the $ store, and we practice cards, questions, whatever, spin, try to hit the color dot we spun (mat can be on floor, wall or door). My little ones usually loved when mat was on wall…seemed neater somehow. I also love the idea above…using it for feeding/swallowing!!! Great for texture avoiders I think! what a fabulous idea, especially for my kids who can’t sit still!